Hello friends! Today we are talking about chai tea, and more specifically chai tea concentrate! You are going to want to add this recipe to your weekly meal prep list so that you can make delicious chai tea in seconds throughout the week! I’m a tea drinker. My whole family lives and breathes for coffee, but I just never got into it. My husband doesn’t drink it either. I might on the odd occasion have a mocha, vanilla latte or frapacchino… but I know that those don’t REALLY count as coffee. One of the things that I love about not being a coffee drinker is that I don’t need something to start my day and feel awake. For me, tea is more of a sensory and emotional experience. I love the warmth of a cup of tea nestled between my hands, I love the aroma from the steam of a cup of spicy chai tea, I love the comfort that I feel when I take a sip of tea and feel the warmth spread through my body as I swallow. When I’m having a hard time finding the right words for an article that I’m writing, usually holding a cup of tea will help me find them. Out of all of the different types of tea out there, chai tea has to be my favorite. 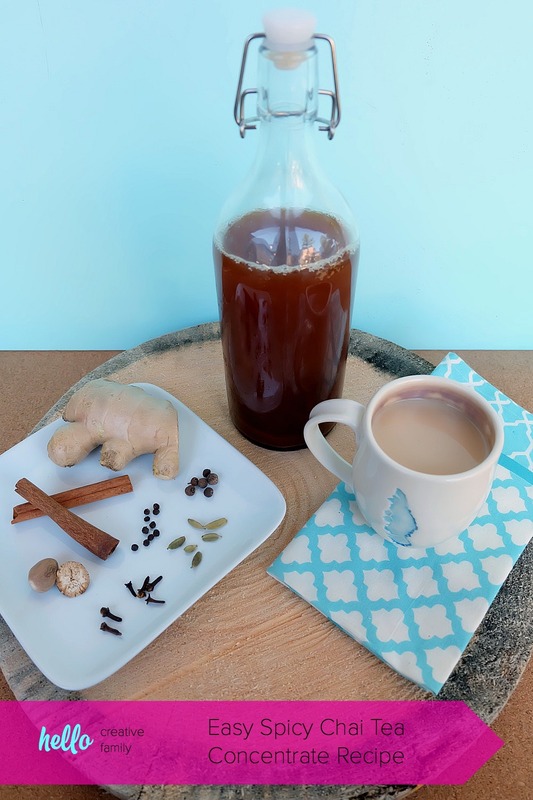 A couple of years ago, Raj from Pink Chai Living, shared her recipe with us for her Authentic Indian Chai Tea recipe. 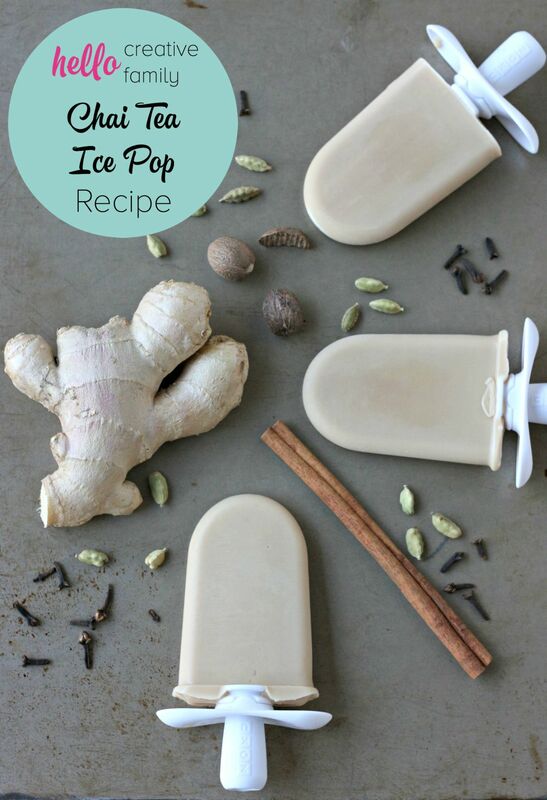 A year after that, I shared one of my favorite summer treats– Chai Tea Ice Pops! Today, 1 year after my last chai tea post, we are returning to the theme with a whole new chai tea recipe– Spicy Chai Tea Concentrate. I love my chai tea spicy. I love the tickle in the throat that a cup of spicy chai tea gives you, how it warms you from head to toe, and how the flavor stays with you after you finish your cup. One of the things I don’t love about chai tea is that it takes awhile to make. I have a bag that I keep filled with my chai tea ingredients, but on school mornings I often don’t have the extra time to let the ingredients simmer on the stove top for 20 minutes then time to add the milk and bring it back up to temperature. Enter my easy spicy chai tea concentrate recipe. First let me share the inspiration with you. Two years ago, the family and I went camping at a campground that had a cantina. At the cantina they had a cafe/bar and ice cream counter. One morning we walked past it as we headed for our morning walk on the beach and I said to The Hubs “I really want a cup of chai tea.” We went and bought one and I noticed a sign saying that the chai was made by a local chai tea company. Later that week at a grocery store near our campground I noticed bottles of chai tea concentrate from the same company. I zeroed in on it right away and put it in the cart. Turns out I was wrong. Chai tea concentrate calls for equal parts concentrate to water. Turns out that the bottle only made 3 cups of chai, bringing them in at $4.00 per cup… Pretty much what you would pay for them at the cafe. Then it hit me. I KNEW how to make my own chai tea concentrate. It was basically just chai tea minus adding the milk at the end! I buy my spices in bulk so making a bottle of chai tea concentrate literally costs me pennies to make. This year when we went camping I brought my own bottle of chai tea concentrate, homemade by little old me. It took up less room than if I had already added the milk to the chai tea, I didn’t have to worry about keeping it super cold like I would if the milk was already in it, and every morning I got a delicious cup of chai. The best part of the whole thing? A whole bottle of the chai tea concentrate cost me pennies to make and I could adjust the different spices to fit my tastes! Ready to try it for yourself? You’ll want to add this to your weekly food prep list! 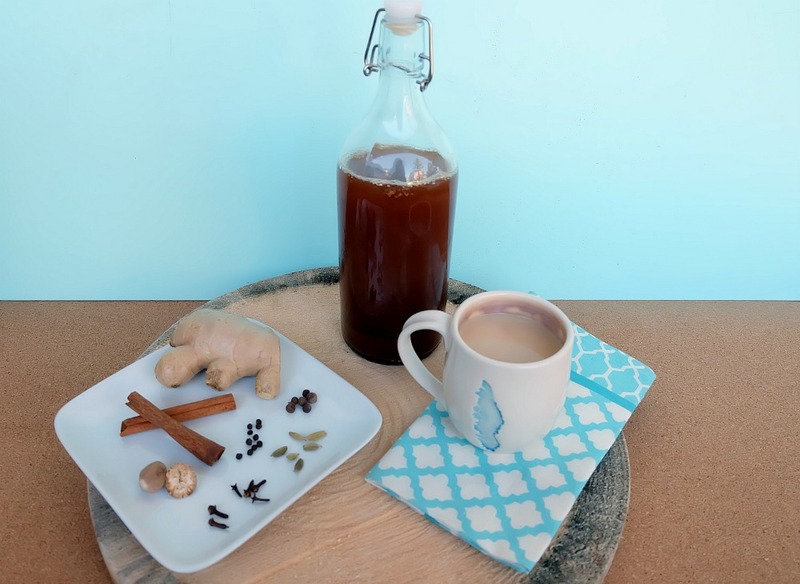 Read on to learn how to make easy spicy chai tea concentrate recipe! Note: I spent months perfecting my recipe, getting it to the perfect level of spice for me, but everyone is different. This is definitely a spicy chai tea. If you like a milder chai tea, feel free to play around with the ratios and just follow the general steps to make your own custom blend of chai tea concentrate! I add making chai tea concentrate to my meal prep list that I do on the weekend. It can simmer away on the stove while I get other meal prep items on my checklist done! Step 1: Add water and all your spices to a medium sized saucepan. On medium high heat bring to a simmer, then reduce to low, cover and allow to simmer for 20 minutes. Step 2: Remove from heat and add tea bags. Allow to steep for 10 minutes. Step 4: Allow your chai tea concentrate to cool enough to pour into glass bottles, then strain through a mesh strainer and use a funnel to pour into bottle. To make a cup of chai, add equal parts milk and chai tea concentrate. Heat on the stove or in the microwave. Tell me… Are you a tea or coffee drinker? Do you love a good cup of chai? Also check out these other chai tea posts! I love chai tea, but I haven’t had great success making it at home. Such a great idea to make your own concentrate for pennies on the dollar. Can’t wait to try this! 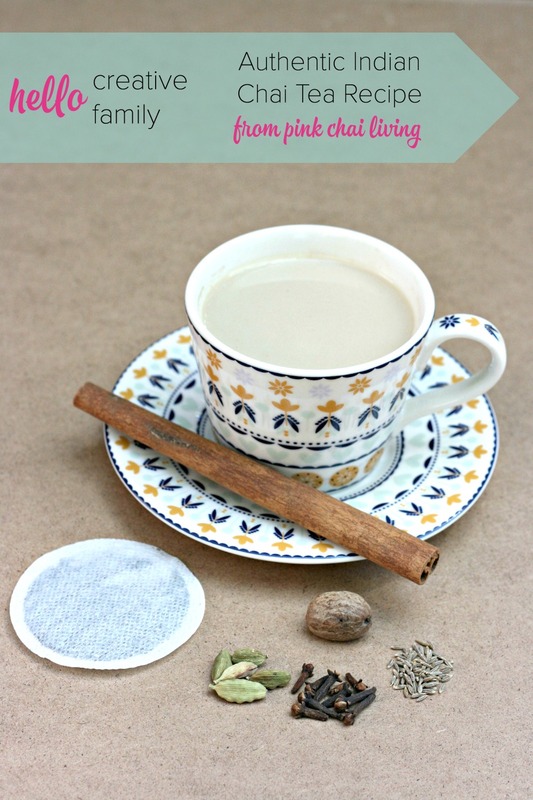 I really enjoy chai tea,will have to try making it at home ! My son would love this recipe. I will have to use this recipe over the Holidays. This is a great way to save money! I personally don’t like chai tea but my daughter loves it. This would make it more affordable. Very nice, I like the strength of chai tea. It has nice spices. Great looking tea I could have with my breakfast.